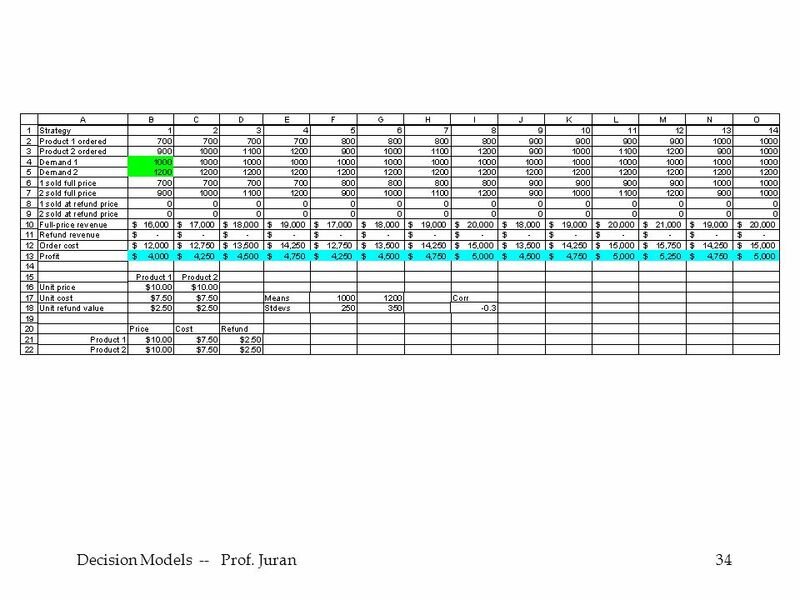 Session 8a. 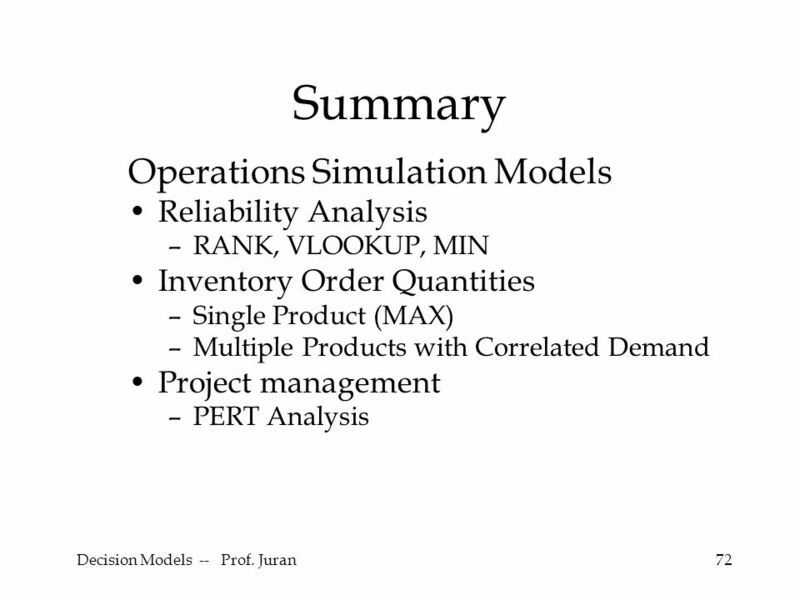 Decision Models -- Prof. Juran2 Overview Operations Simulation Models Reliability Analysis –RANK, VLOOKUP, MIN Inventory Order Quantities. 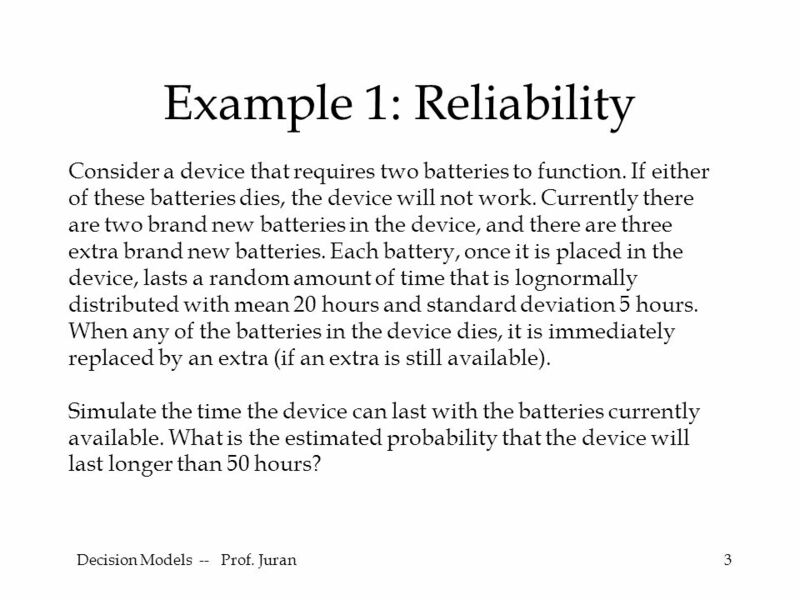 3 Decision Models -- Prof. Juran3 Example 1: Reliability Consider a device that requires two batteries to function. If either of these batteries dies, the device will not work. Currently there are two brand new batteries in the device, and there are three extra brand new batteries. 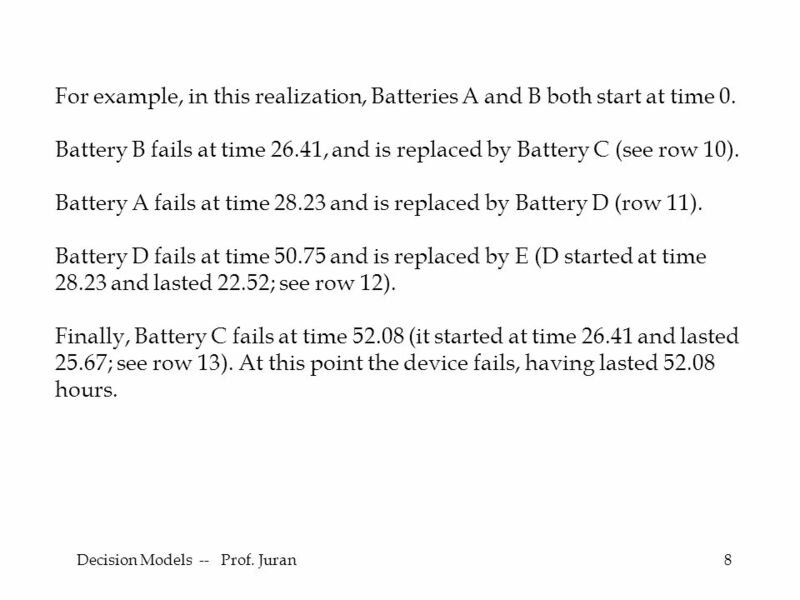 Each battery, once it is placed in the device, lasts a random amount of time that is lognormally distributed with mean 20 hours and standard deviation 5 hours. When any of the batteries in the device dies, it is immediately replaced by an extra (if an extra is still available). 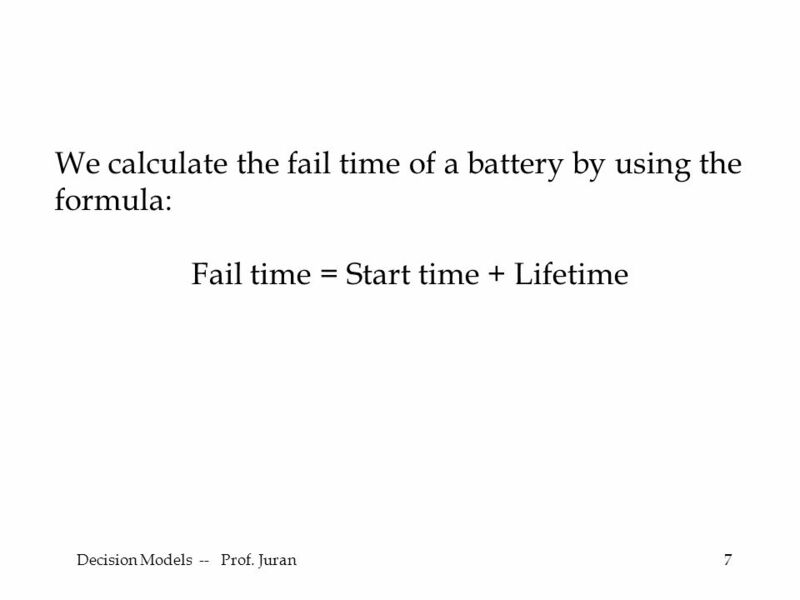 Simulate the time the device can last with the batteries currently available. What is the estimated probability that the device will last longer than 50 hours? 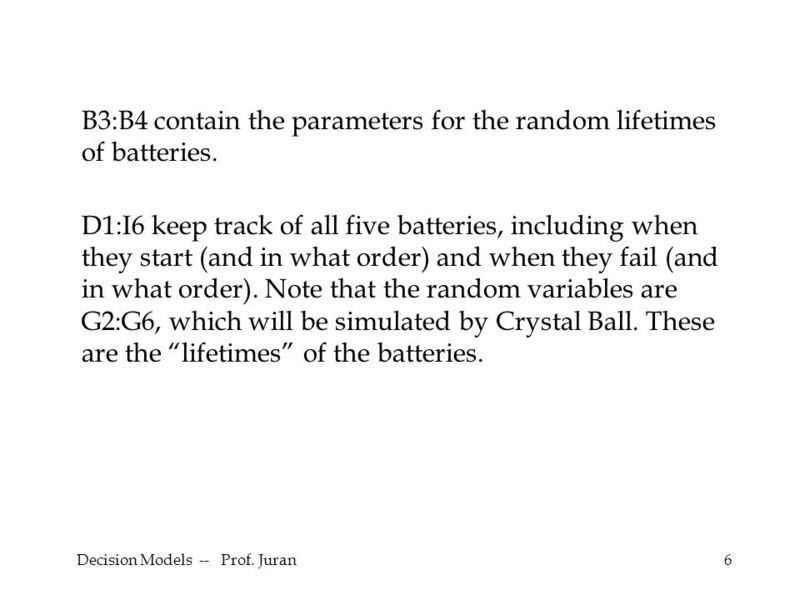 6 6 B3:B4 contain the parameters for the random lifetimes of batteries. D1:I6 keep track of all five batteries, including when they start (and in what order) and when they fail (and in what order). 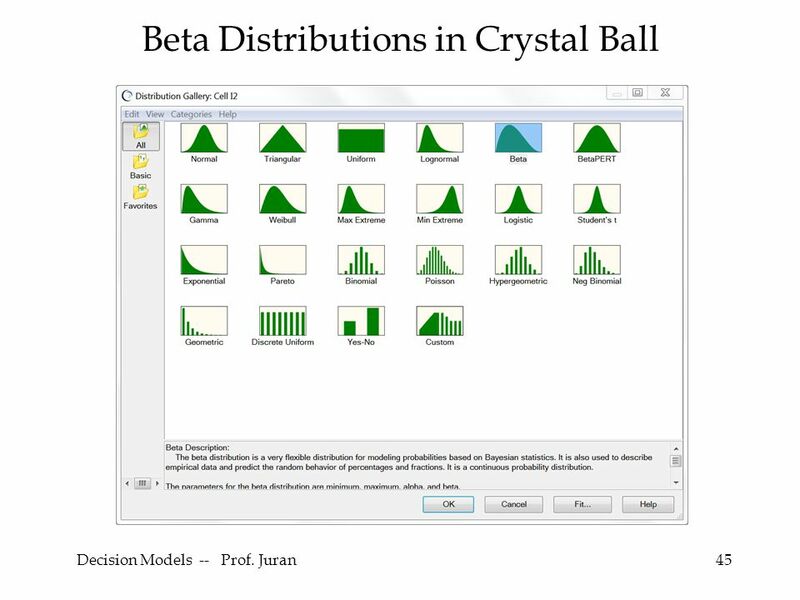 Note that the random variables are G2:G6, which will be simulated by Crystal Ball. These are the “lifetimes” of the batteries. 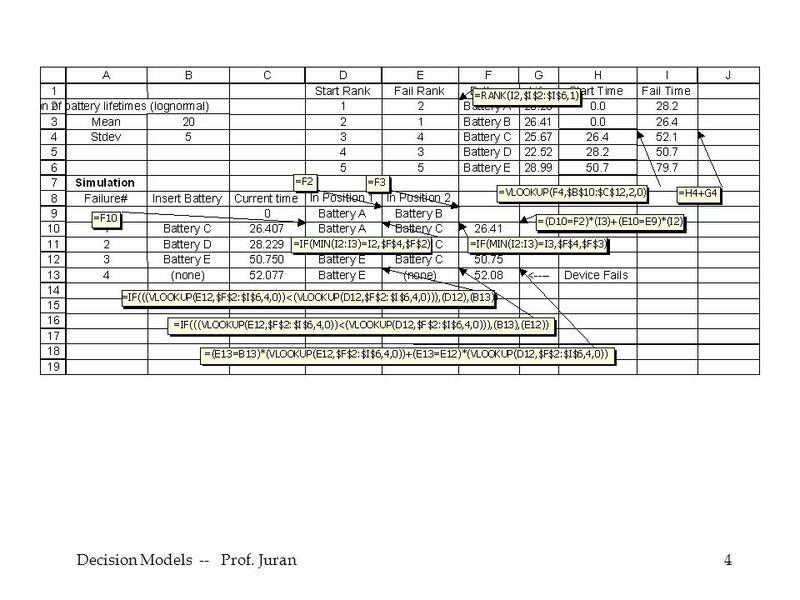 8 Decision Models -- Prof. Juran8 For example, in this realization, Batteries A and B both start at time 0. Battery B fails at time 26.41, and is replaced by Battery C (see row 10). Battery A fails at time 28.23 and is replaced by Battery D (row 11). 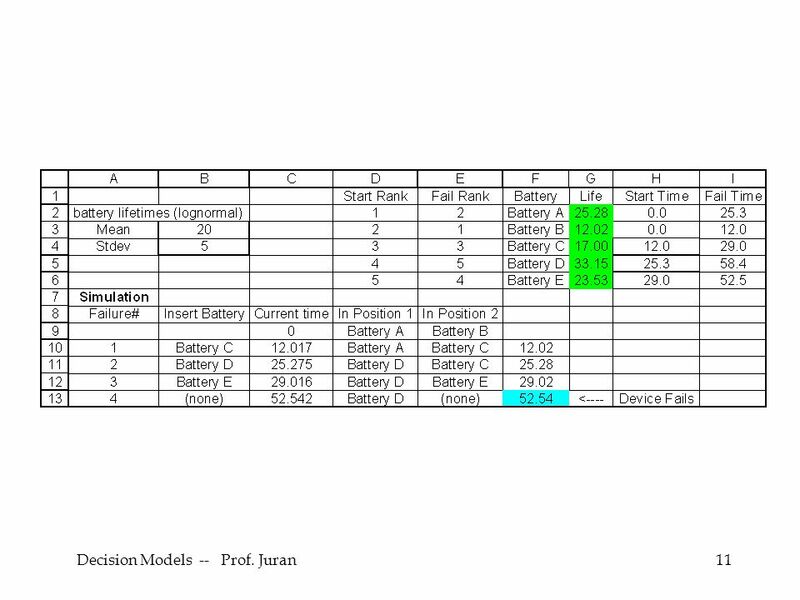 Battery D fails at time 50.75 and is replaced by E (D started at time 28.23 and lasted 22.52; see row 12). 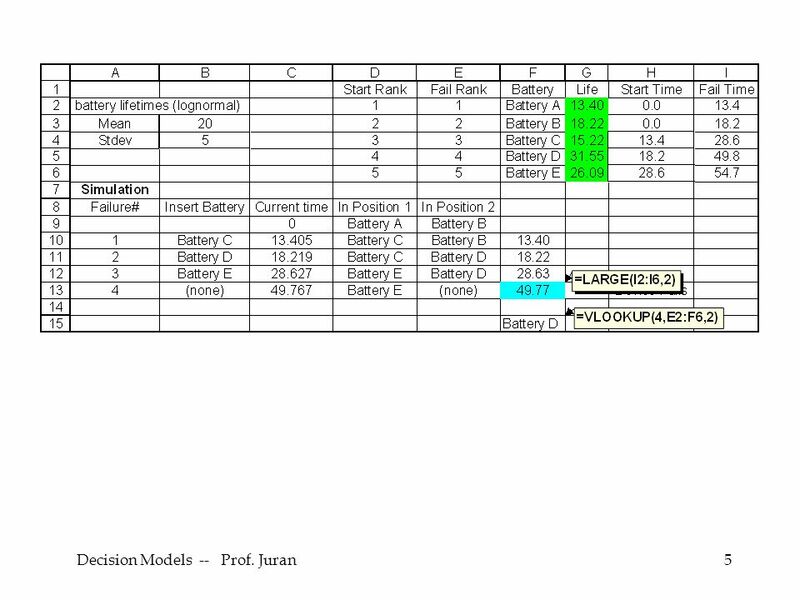 Finally, Battery C fails at time 52.08 (it started at time 26.41 and lasted 25.67; see row 13). At this point the device fails, having lasted 52.08 hours. 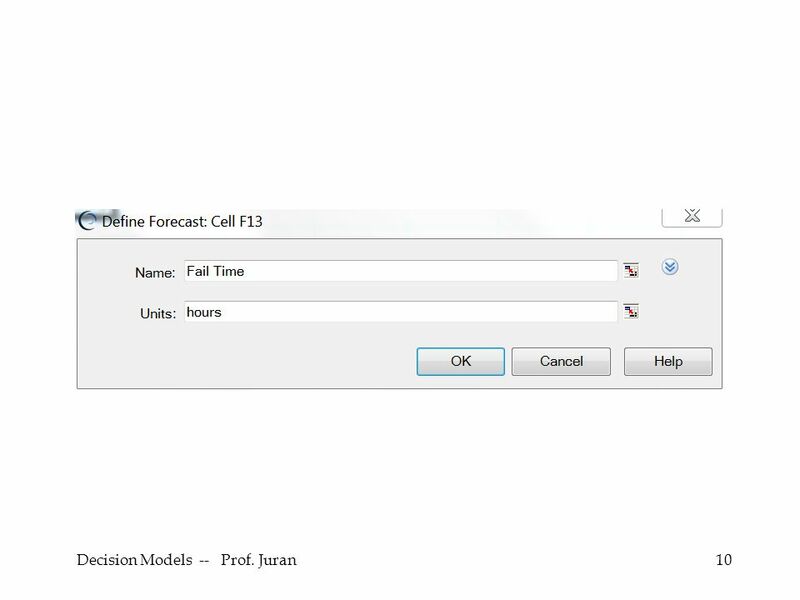 15 Decision Models -- Prof. Juran15 Using the frequency chart’s “certainty” feature, we can drag the lower “grabber” to a point where the left window reads 50 (or Crystal Ball will allow you simply to type 50 into the left window). 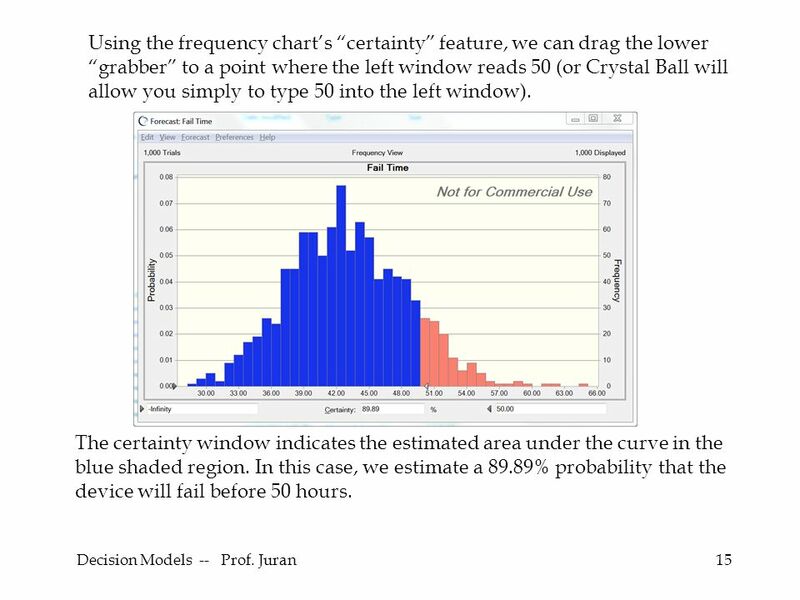 The certainty window indicates the estimated area under the curve in the blue shaded region. 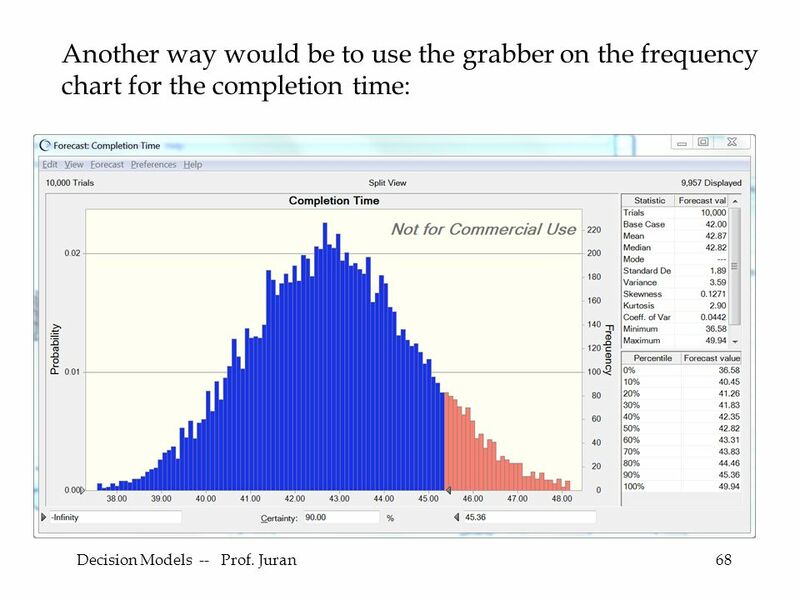 In this case, we estimate a 89.89% probability that the device will fail before 50 hours. 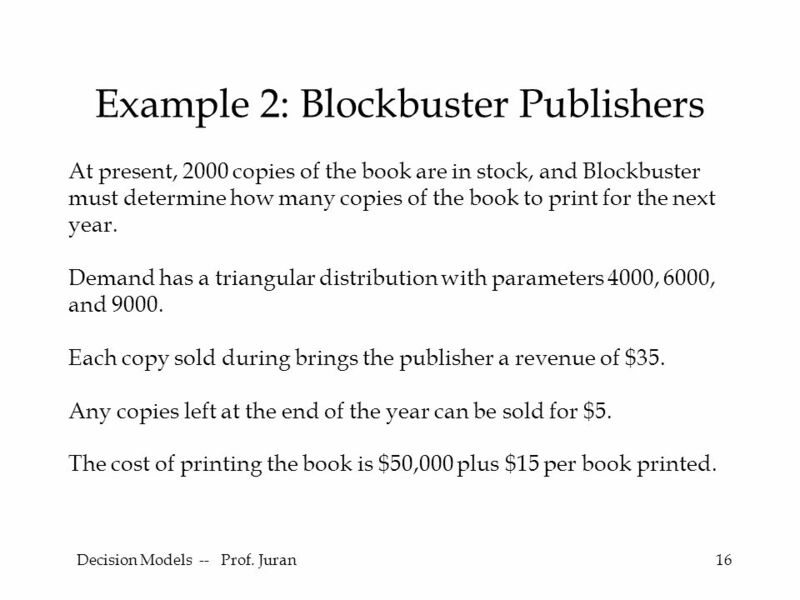 16 Decision Models -- Prof. Juran16 Example 2: Blockbuster Publishers At present, 2000 copies of the book are in stock, and Blockbuster must determine how many copies of the book to print for the next year. 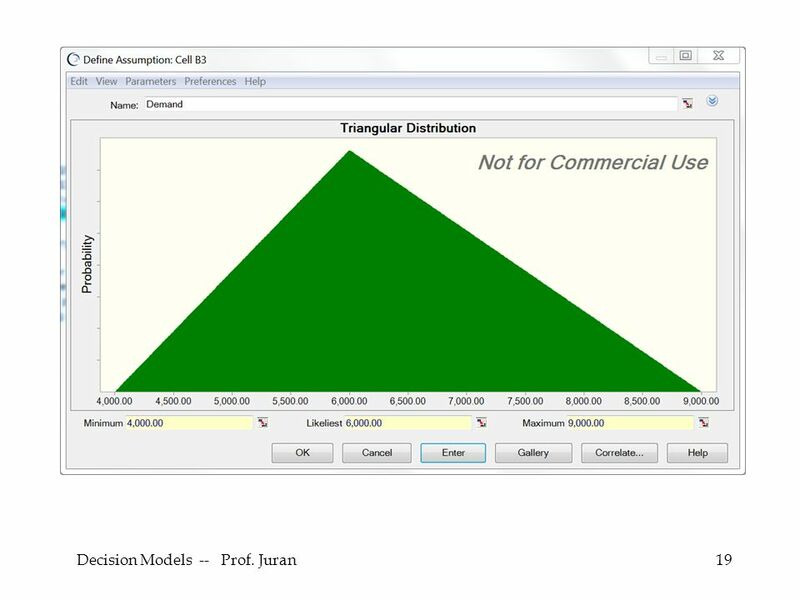 Demand has a triangular distribution with parameters 4000, 6000, and 9000. Each copy sold during brings the publisher a revenue of $35. Any copies left at the end of the year can be sold for $5. The cost of printing the book is $50,000 plus $15 per book printed. 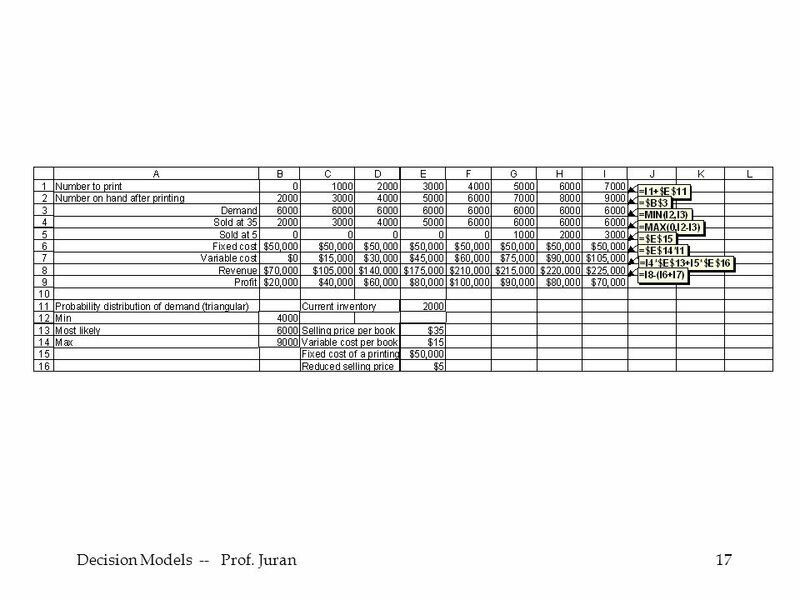 18 Decision Models -- Prof. Juran18 Somewhat arbitrarily, we have decided to consider possible order quantities of 0, 1000, 2000, 3000, 4000, 5000, 6000, and 7000 (B1:I1). For each possible order quantity, we have a fairly simple income statement-like analysis in rows 2 through 9. 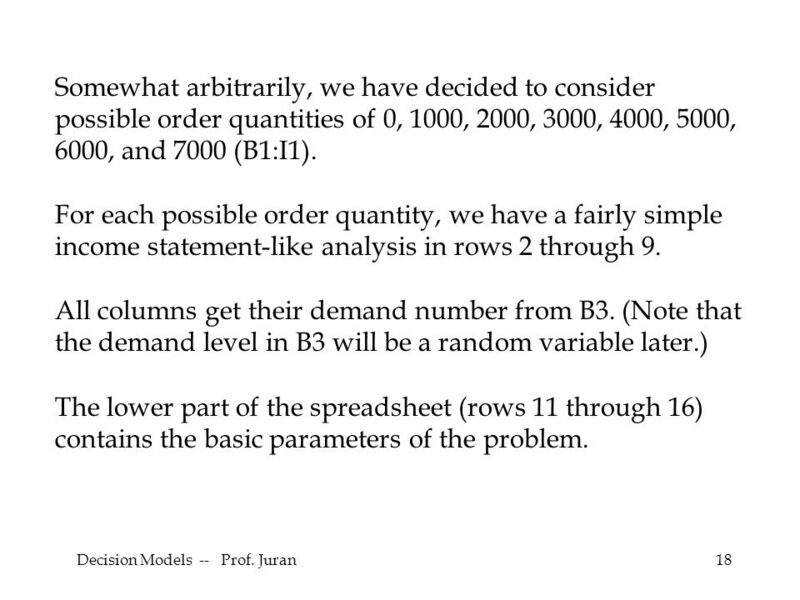 All columns get their demand number from B3. 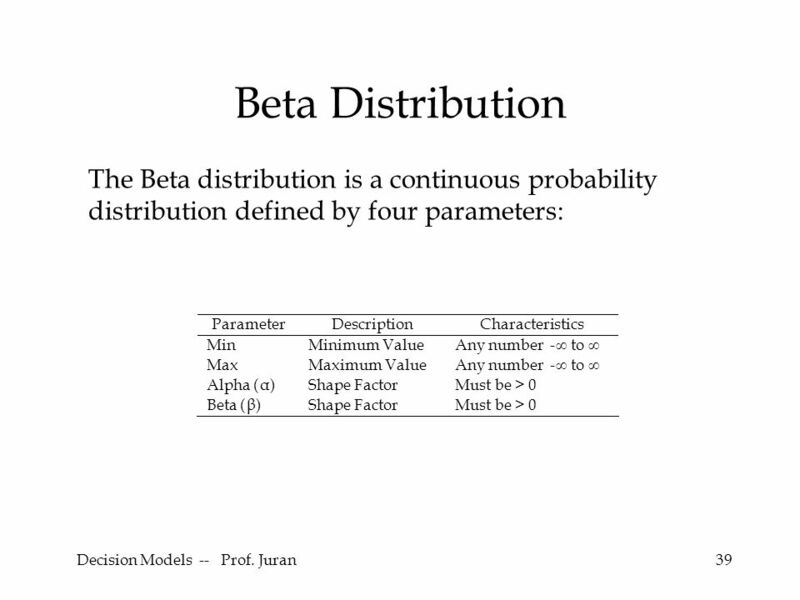 (Note that the demand level in B3 will be a random variable later.) 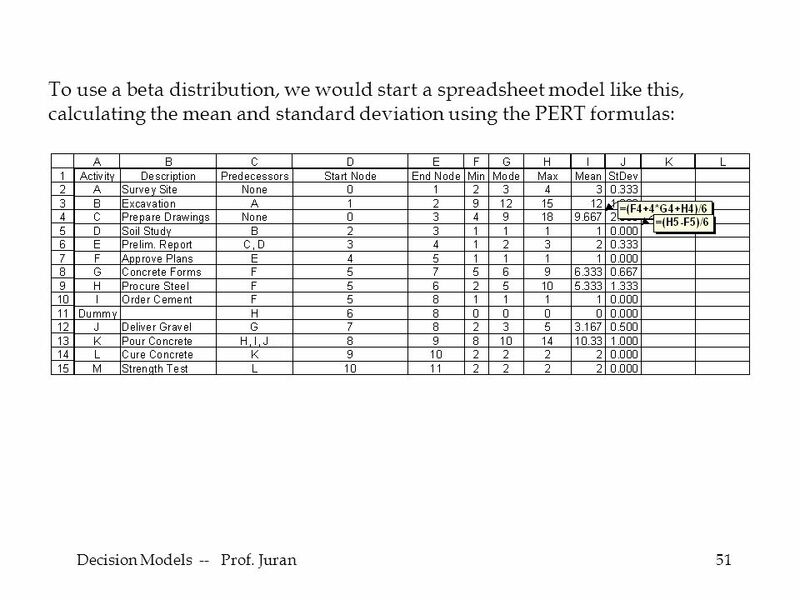 The lower part of the spreadsheet (rows 11 through 16) contains the basic parameters of the problem. 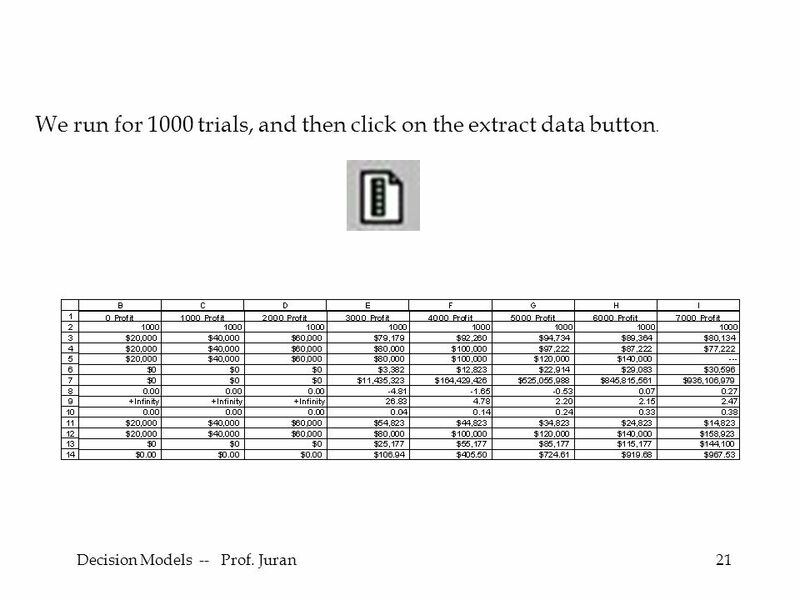 21 Decision Models -- Prof. Juran21 We run for 1000 trials, and then click on the extract data button. 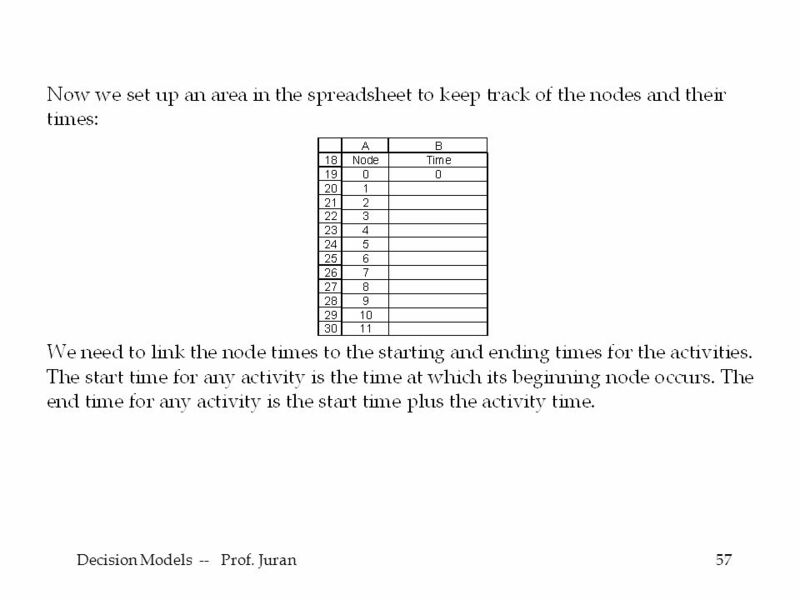 23 Decision Models -- Prof. Juran23 Does your answer change if 4000 copies are currently in stock? 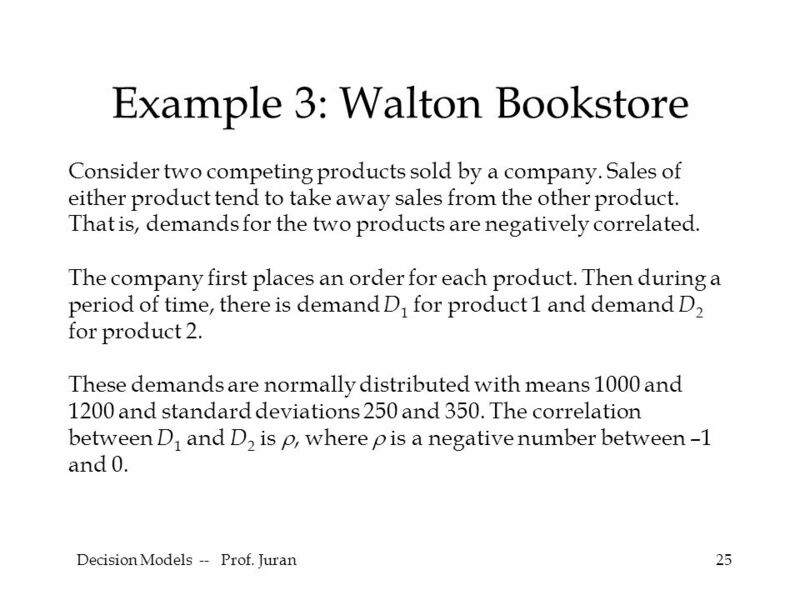 25 Decision Models -- Prof. Juran25 Example 3: Walton Bookstore Consider two competing products sold by a company. Sales of either product tend to take away sales from the other product. 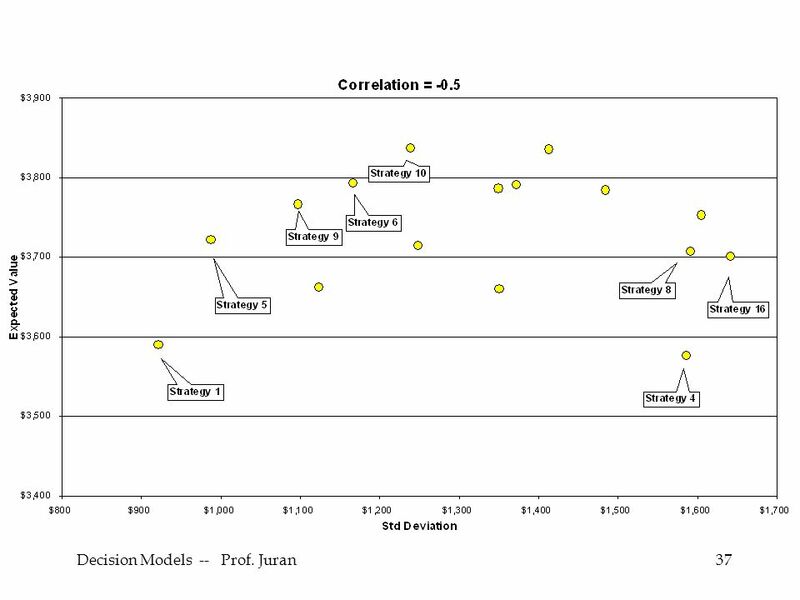 That is, demands for the two products are negatively correlated. The company first places an order for each product. 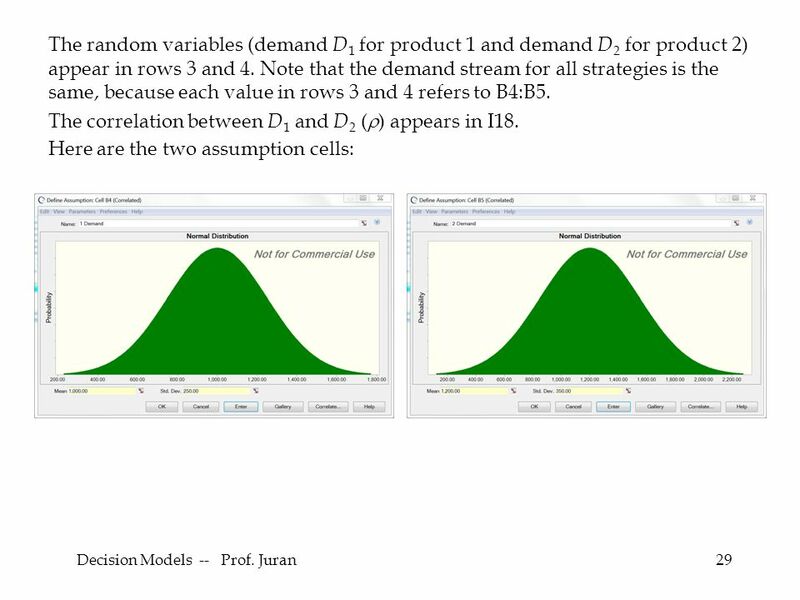 Then during a period of time, there is demand D 1 for product 1 and demand D 2 for product 2. 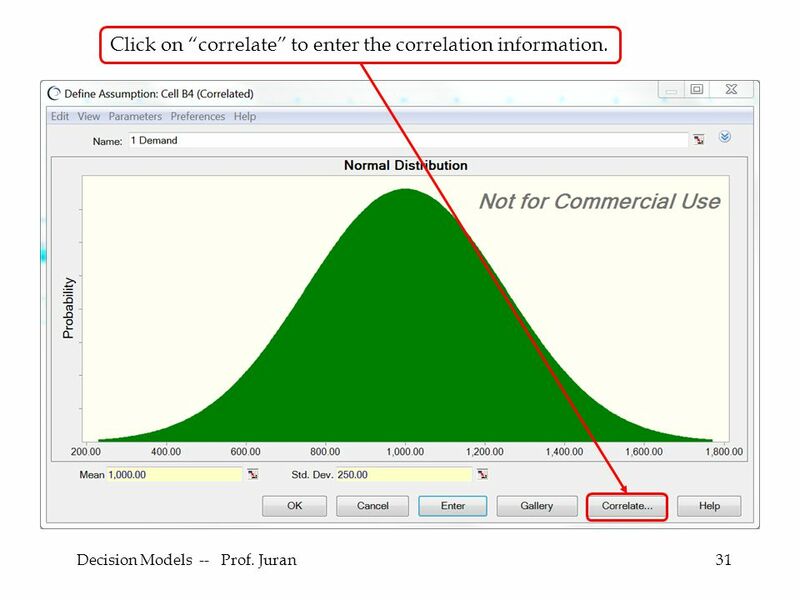 These demands are normally distributed with means 1000 and 1200 and standard deviations 250 and 350. 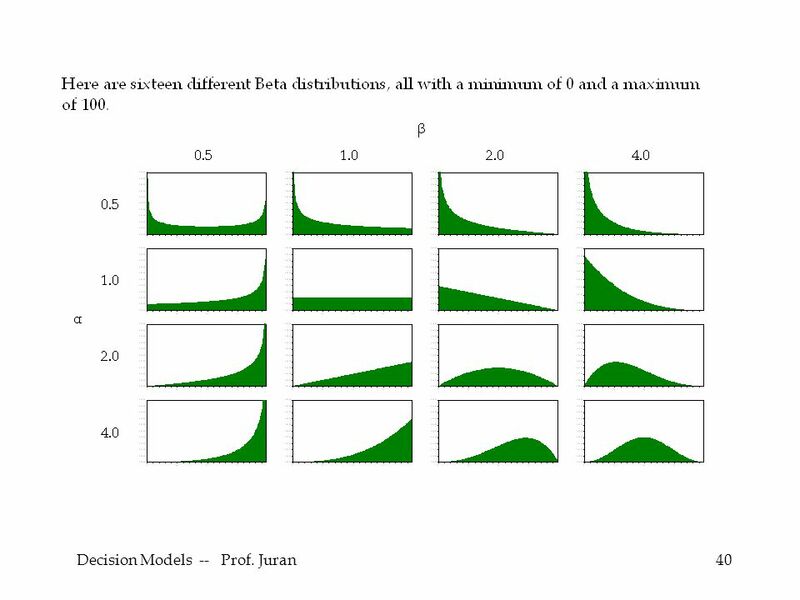 The correlation between D 1 and D 2 is , where  is a negative number between –1 and 0. 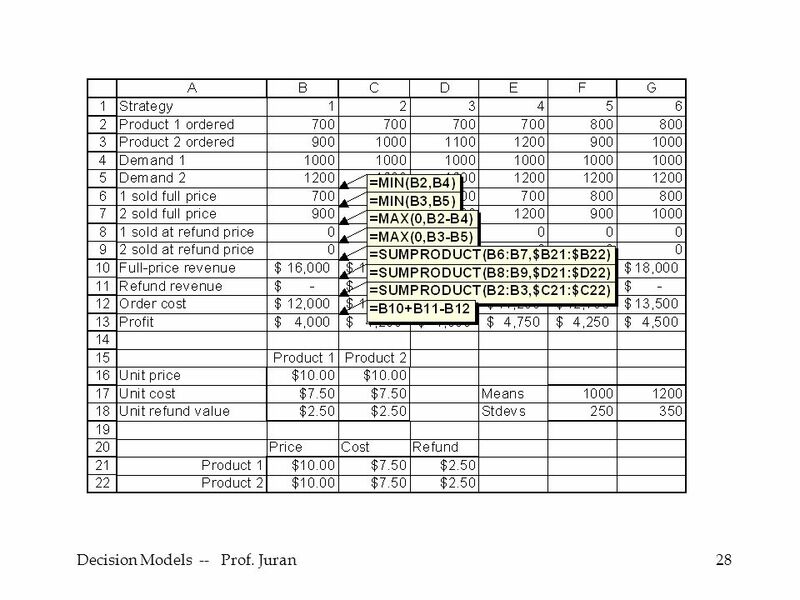 26 Decision Models -- Prof. Juran26 The unit cost of each product is $7.50, the unit price for each product is $10, and the unit refund for any unit of either product not sold is $2.50. 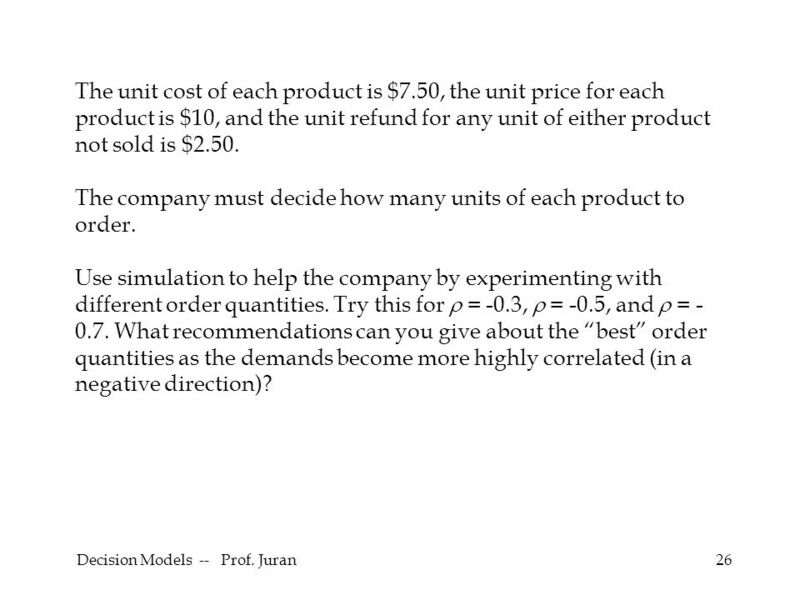 The company must decide how many units of each product to order. 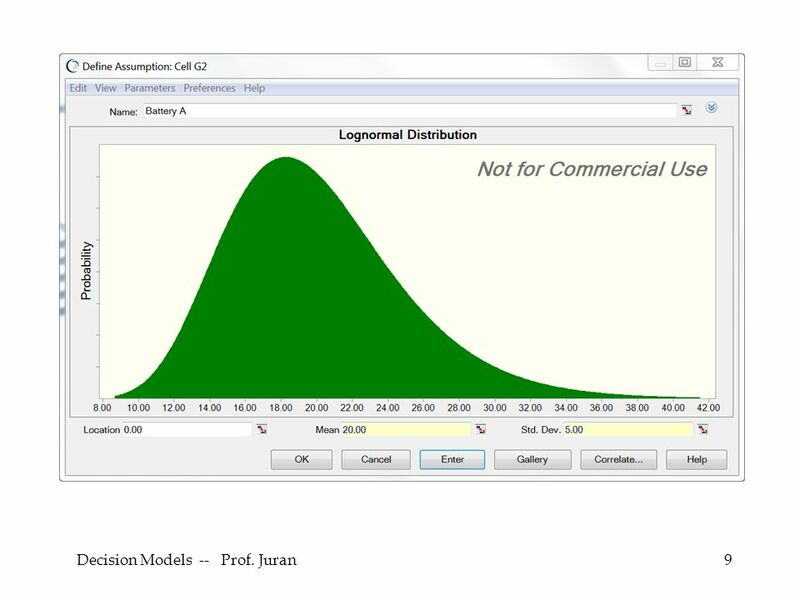 Use simulation to help the company by experimenting with different order quantities. 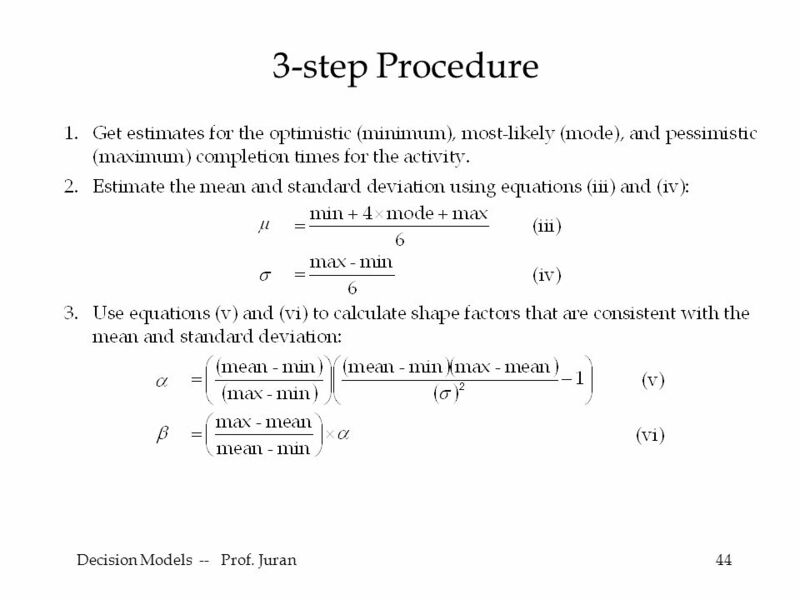 Try this for  = -0.3,  = -0.5, and  = - 0.7. 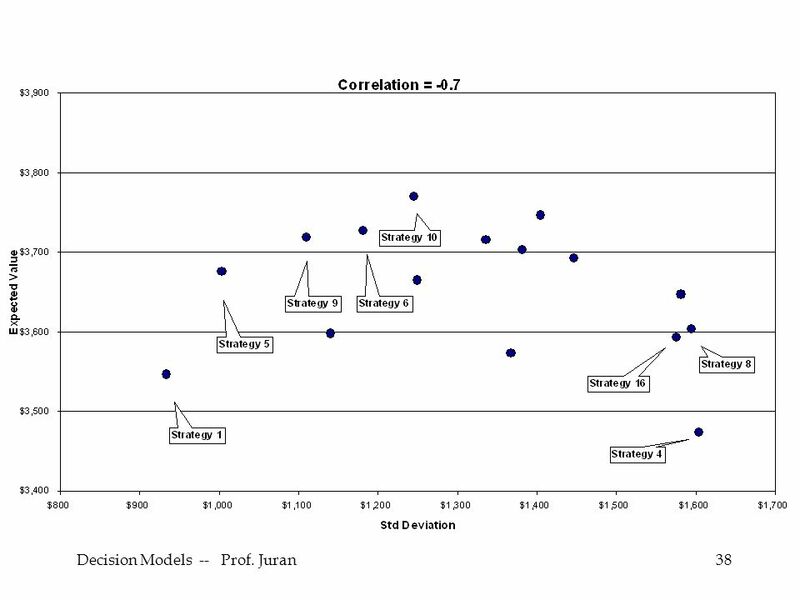 What recommendations can you give about the “best” order quantities as the demands become more highly correlated (in a negative direction)? 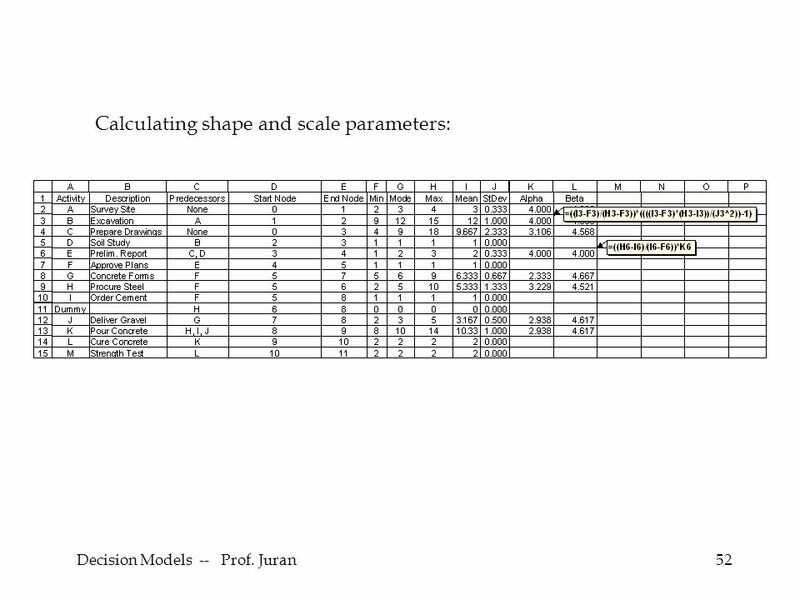 27 Decision Models -- Prof. Juran27 We have laid out (somewhat arbitrarily) 16 different combinations of order quantities for the two products (B2:Q3). 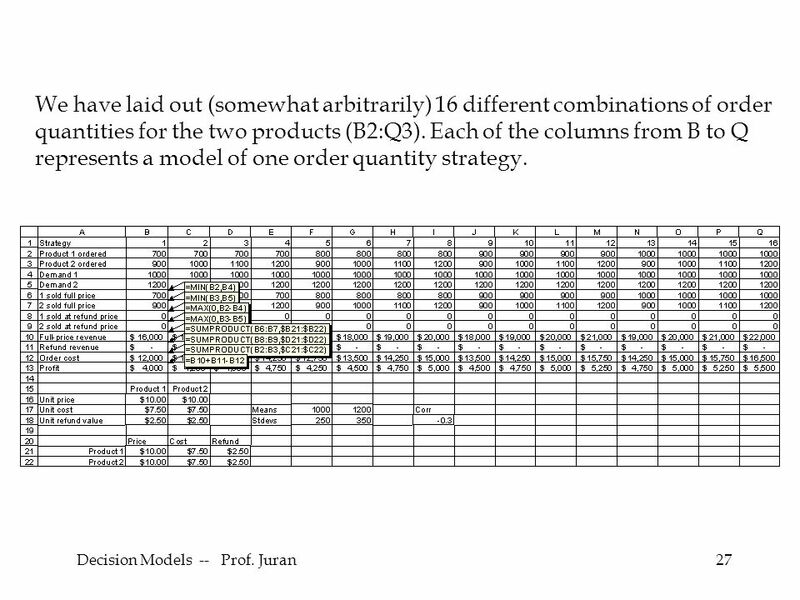 Each of the columns from B to Q represents a model of one order quantity strategy. 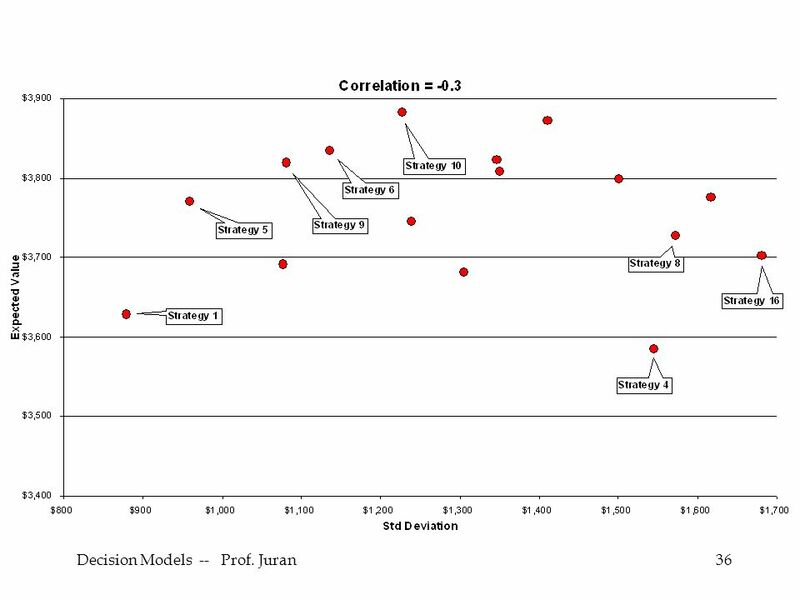 30 Decision Models -- Prof. Juran30 For more than a few correlated green cells, it’s more efficient to use the matrix view. 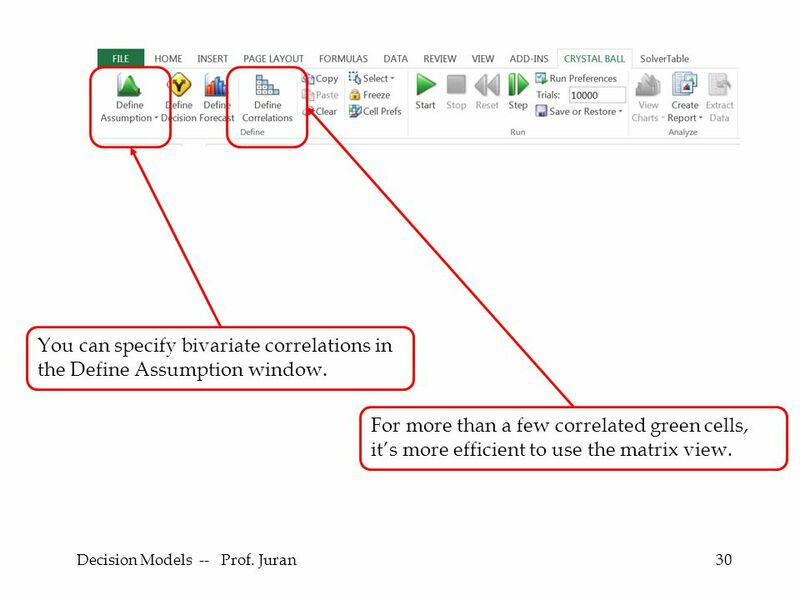 You can specify bivariate correlations in the Define Assumption window. 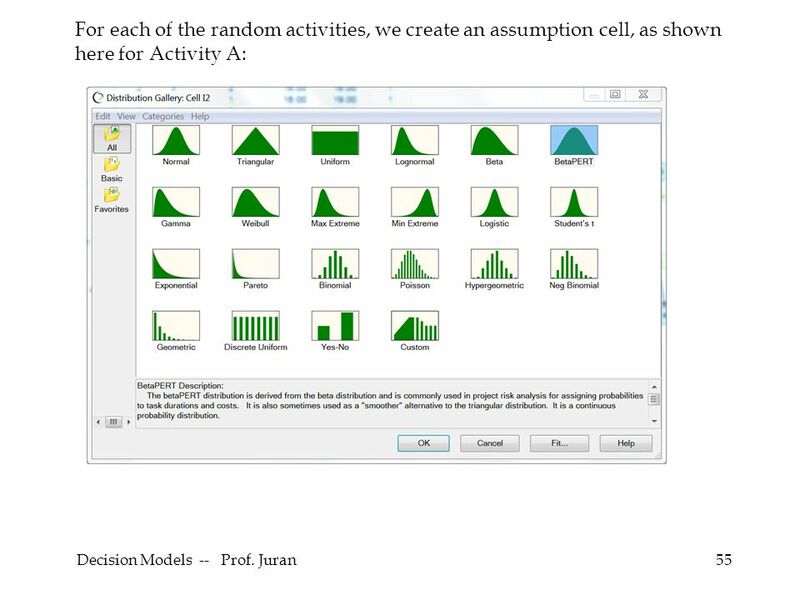 31 Decision Models -- Prof. Juran31 Click on “correlate” to enter the correlation information. 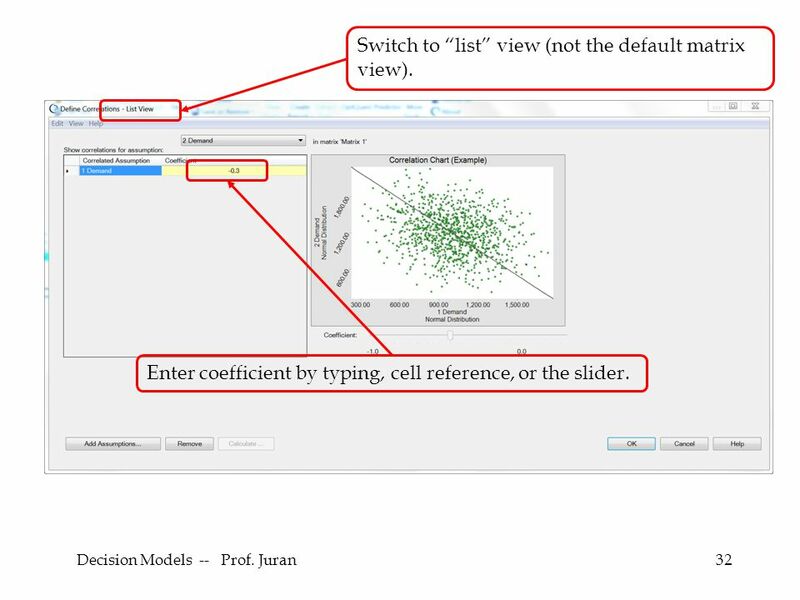 32 Decision Models -- Prof. Juran32 Switch to “list” view (not the default matrix view). 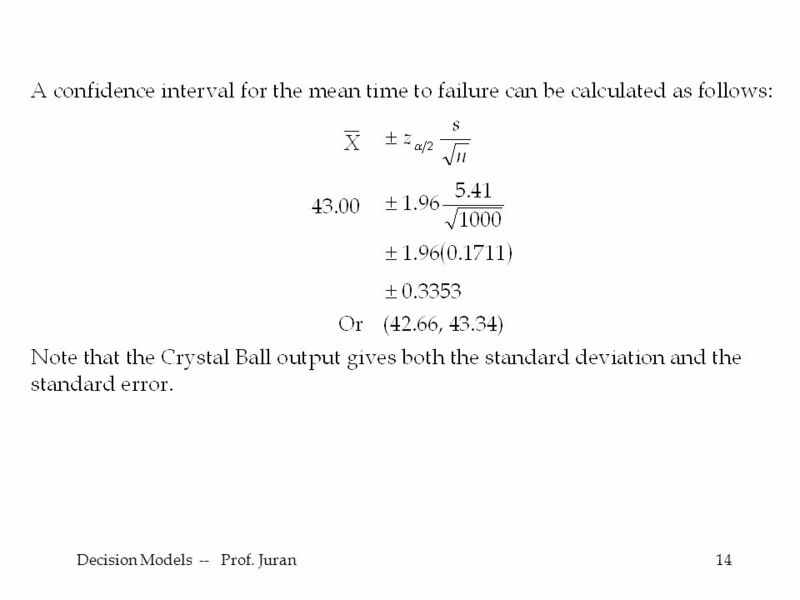 Enter coefficient by typing, cell reference, or the slider. 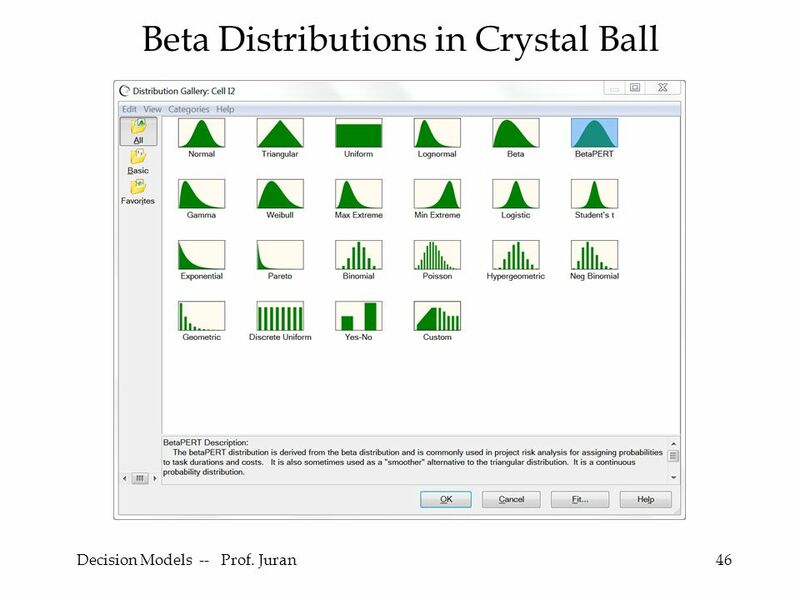 41 Decision Models -- Prof. Juran41 The Beta distribution is popular among simulation modelers because it can take on a wide variety of shapes, as shown in the graphs above. 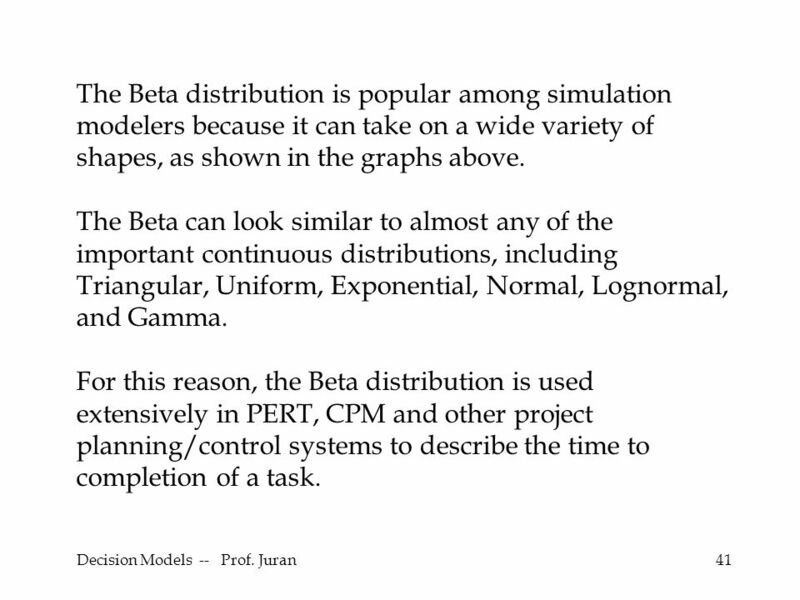 The Beta can look similar to almost any of the important continuous distributions, including Triangular, Uniform, Exponential, Normal, Lognormal, and Gamma. 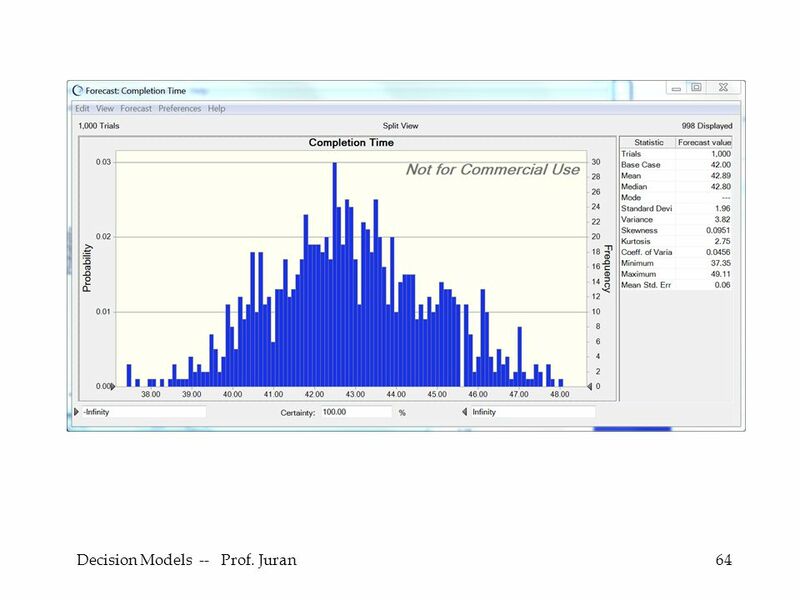 For this reason, the Beta distribution is used extensively in PERT, CPM and other project planning/control systems to describe the time to completion of a task. 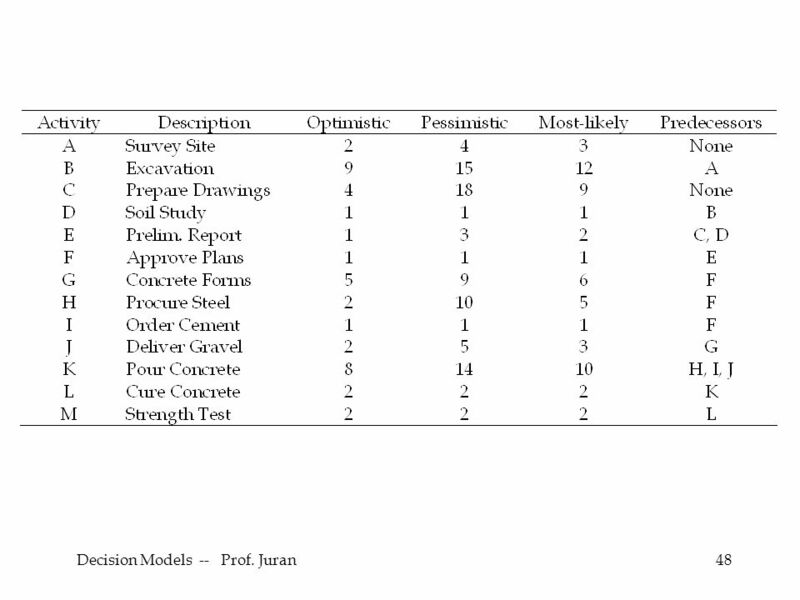 47 Decision Models -- Prof. Juran47 Operations Example: Project Management (PERT) Sharon Katz is project manager in charge of laying the foundation for the new Brook Museum of Art in New Haven, Connecticut. Liya Brook, the benefactor and namesake of the museum, wants to have the work done within 41 weeks, but Sharon wants to quote a completion time that she is 90% confident of achieving. 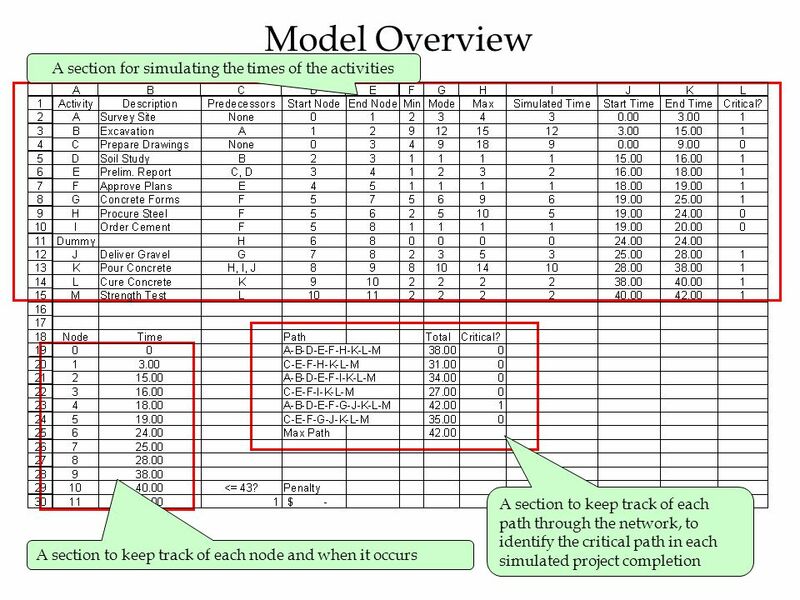 The contract specifies a penalty of $10,000 per week for each week the completion of the project extends beyond week 43. 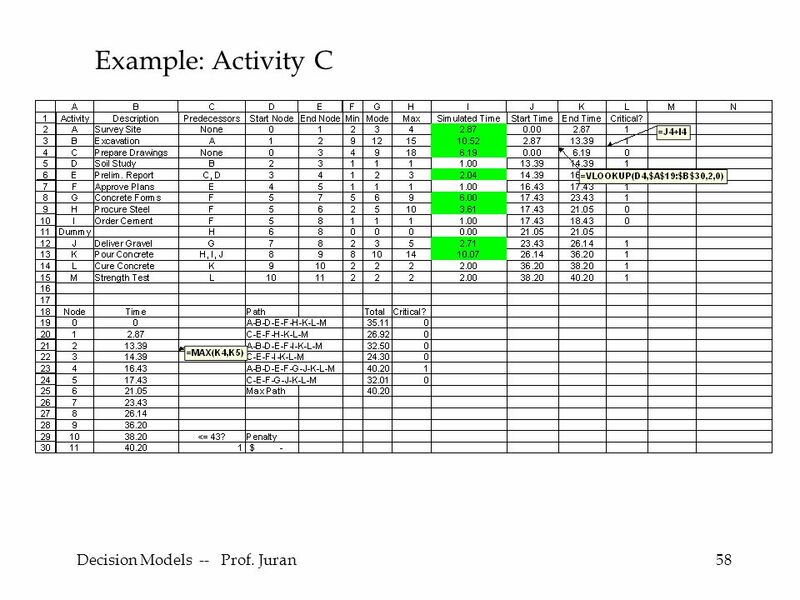 54 Decision Models -- Prof. Juran54 Here’s the section keeping track of the activity times. 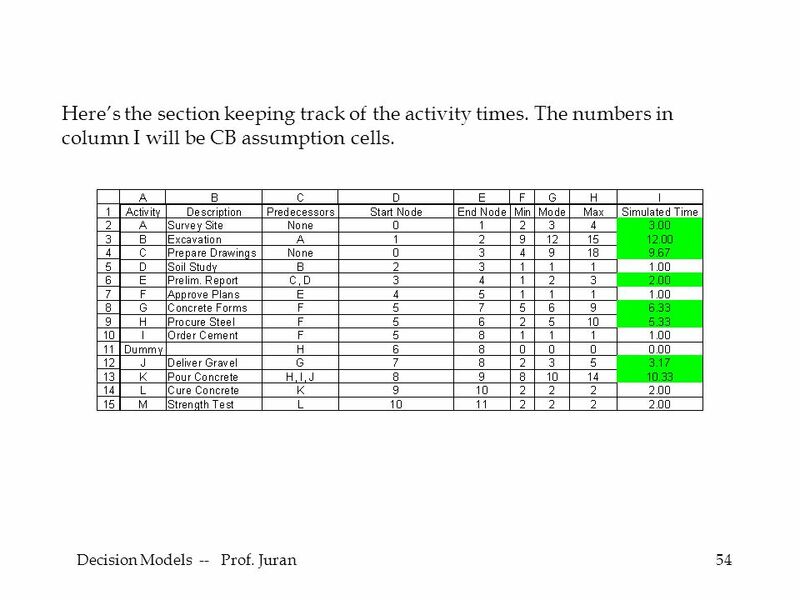 The numbers in column I will be CB assumption cells. 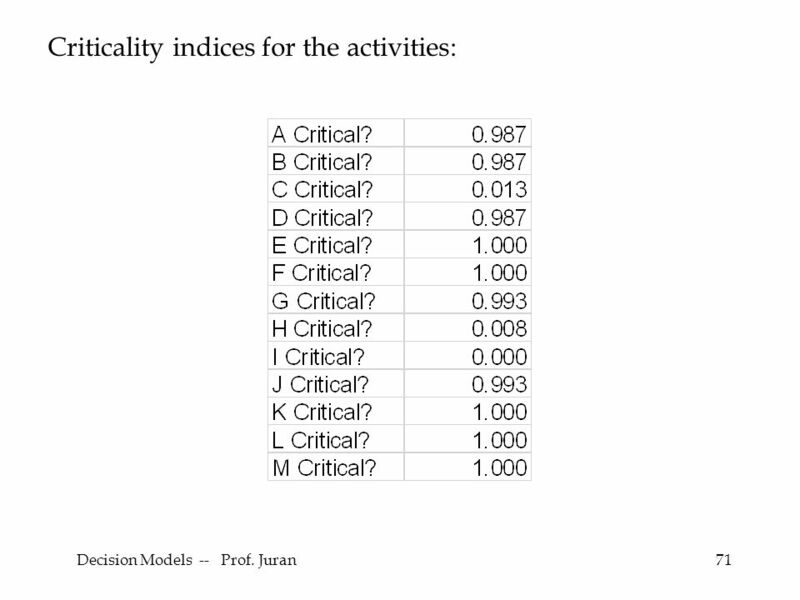 61 Decision Models -- Prof. Juran61 Now, for each activity, we can set up an IF statement to say whether the activity was critical for any particular realization of the model. 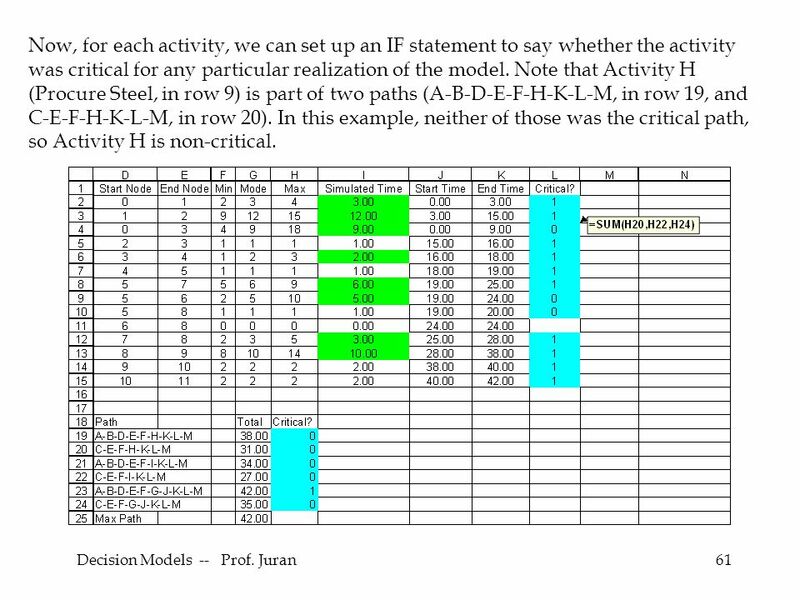 Note that Activity H (Procure Steel, in row 9) is part of two paths (A-B-D-E-F-H-K-L-M, in row 19, and C-E-F-H-K-L-M, in row 20). 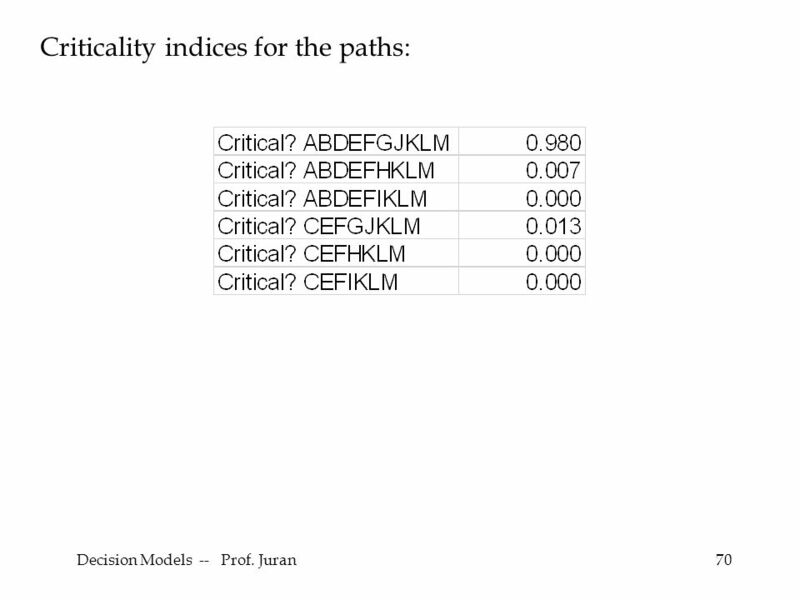 In this example, neither of those was the critical path, so Activity H is non-critical. 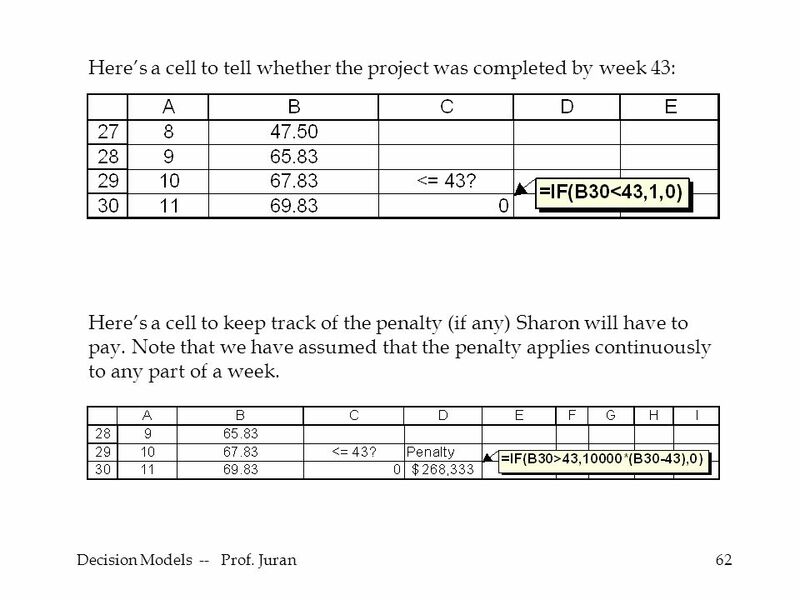 62 Decision Models -- Prof. Juran62 Here’s a cell to tell whether the project was completed by week 43: Here’s a cell to keep track of the penalty (if any) Sharon will have to pay. Note that we have assumed that the penalty applies continuously to any part of a week. 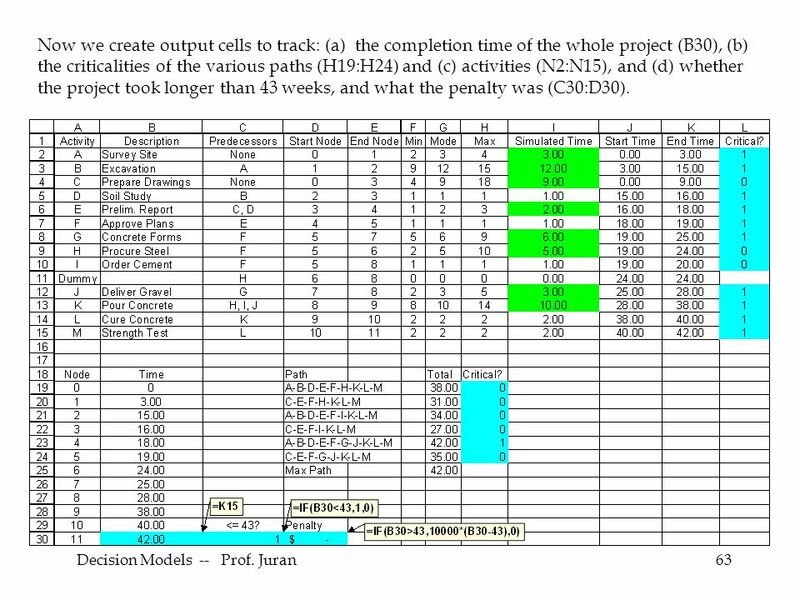 63 Decision Models -- Prof. Juran63 Now we create output cells to track: (a) the completion time of the whole project (B30), (b) the criticalities of the various paths (H19:H24) and (c) activities (N2:N15), and (d) whether the project took longer than 43 weeks, and what the penalty was (C30:D30). 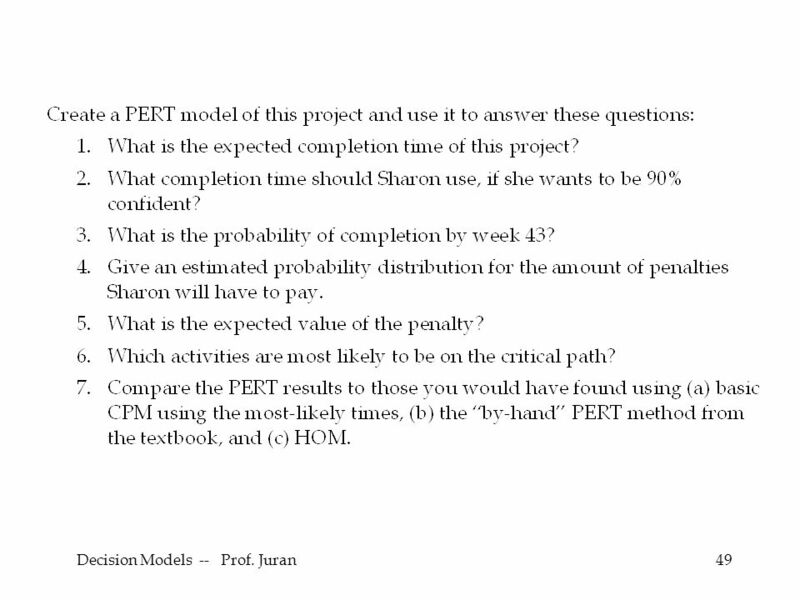 Download ppt "Session 8a. 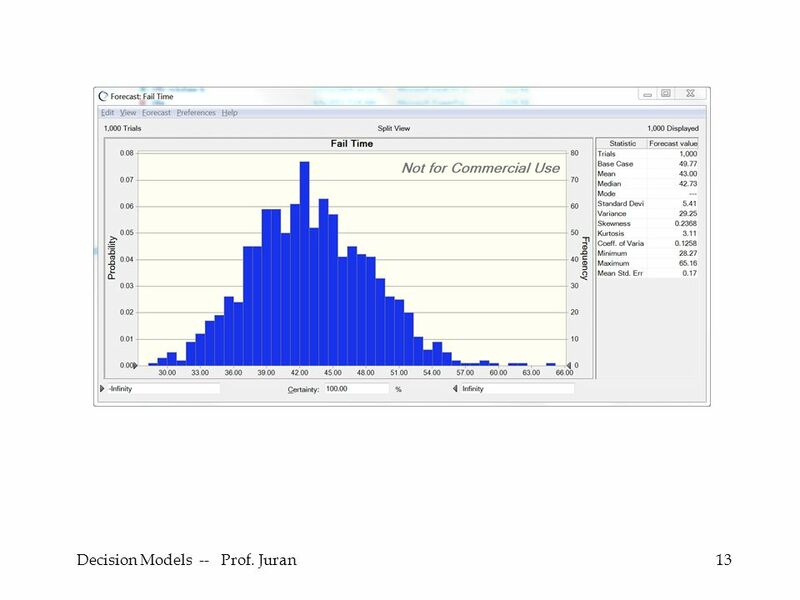 Decision Models -- Prof. Juran2 Overview Operations Simulation Models Reliability Analysis –RANK, VLOOKUP, MIN Inventory Order Quantities." 1. 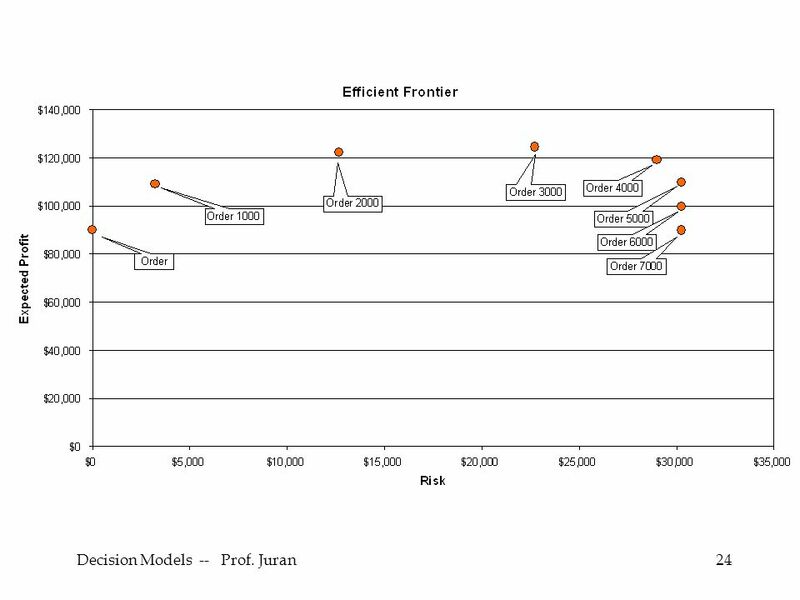 If the monopolist depicted in the graph produces at the profit-maximizing output, what will be the firm’s economic profit? Explain. 2. Lightly shade. 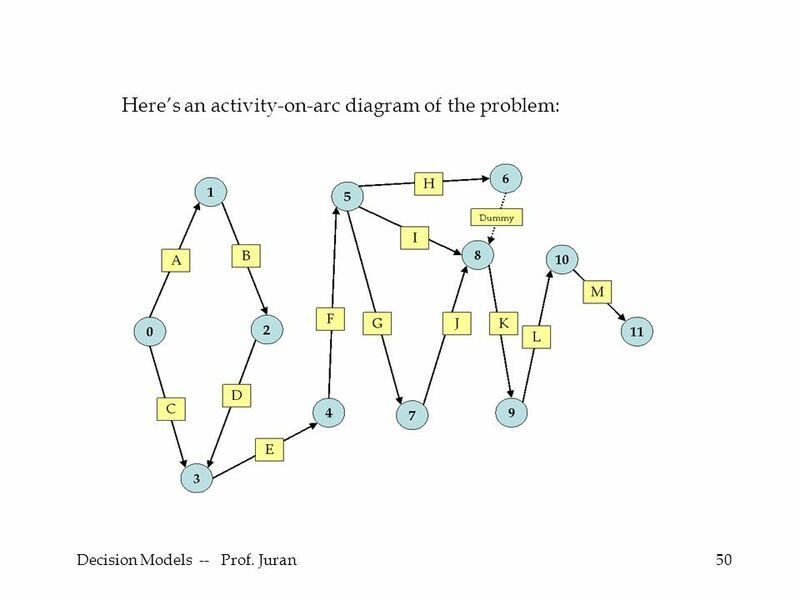 Chapter 18 If mathematical analysis is too difficult, we can try each possibility out on paper. That way we can find which alternative appears to work. Session 9a. 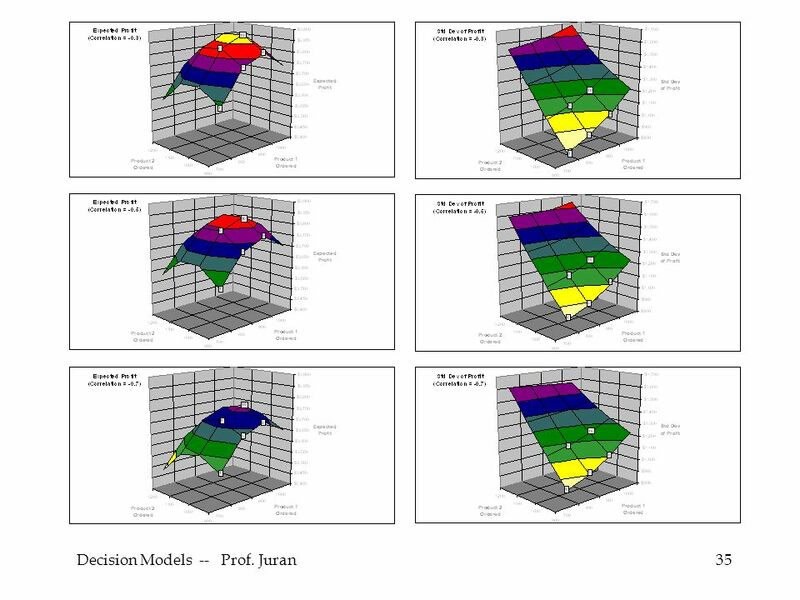 Decision Models -- Prof. Juran2 Overview Finance Simulation Models Forecasting –Retirement Planning –Butterfly Strategy Risk Management –Introduction. 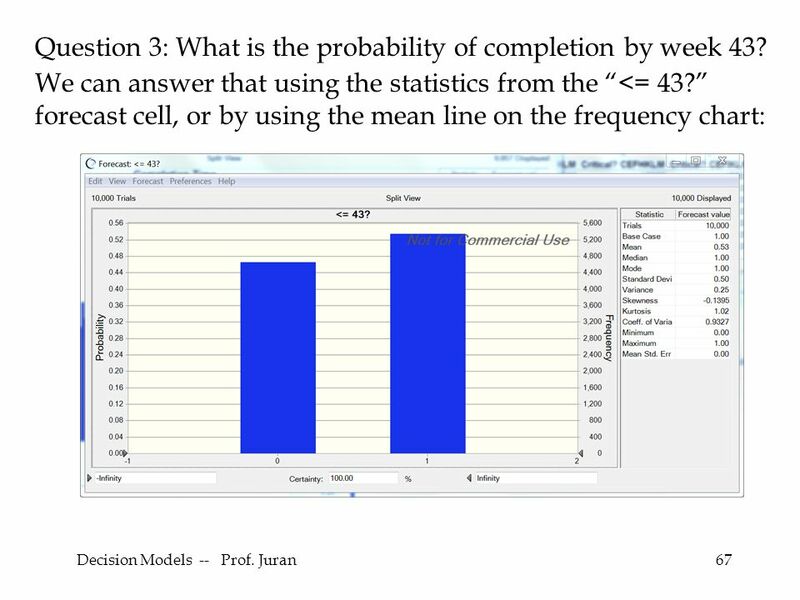 1 COMM 301: Empirical Research in Communication Lecture 15 – Hypothesis Testing Kwan M Lee. 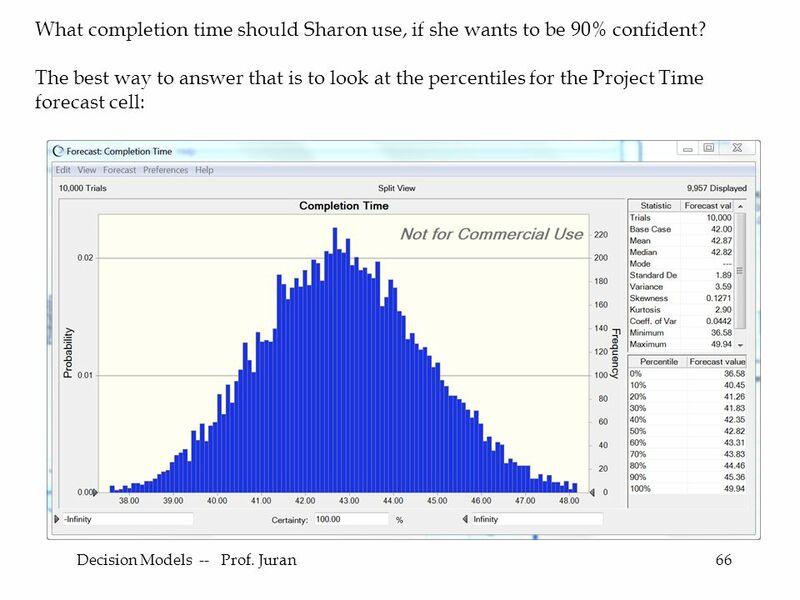 Slides 2c: Using Spreadsheets for Modeling - Excel Concepts (Updated 1/19/2005) There are several reasons for the popularity of spreadsheets: –Data are. 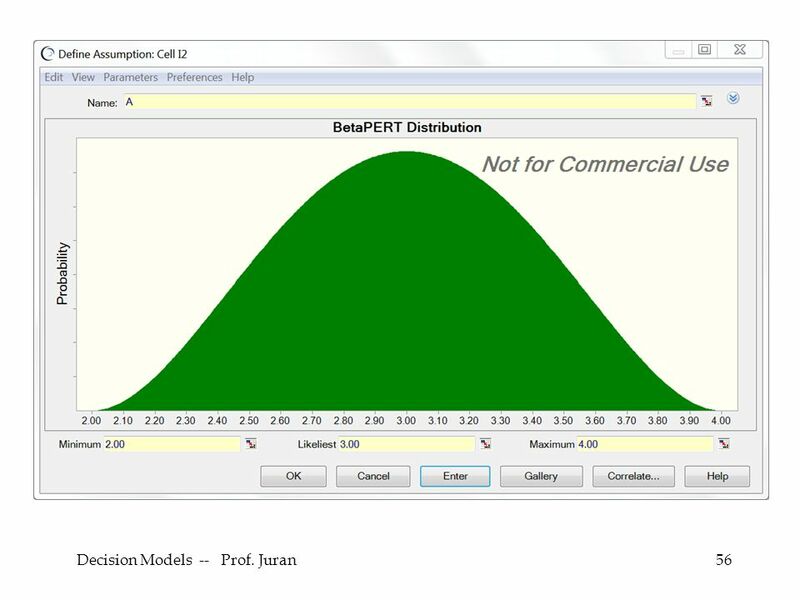 Session 8b Decision Models -- Prof. Juran. 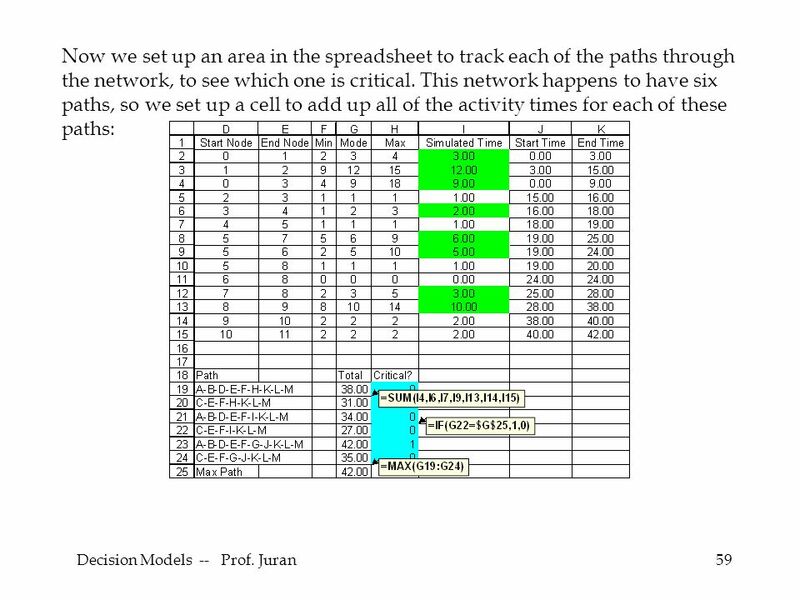 6 - 1 Lecture 4 Analysis Using Spreadsheets. 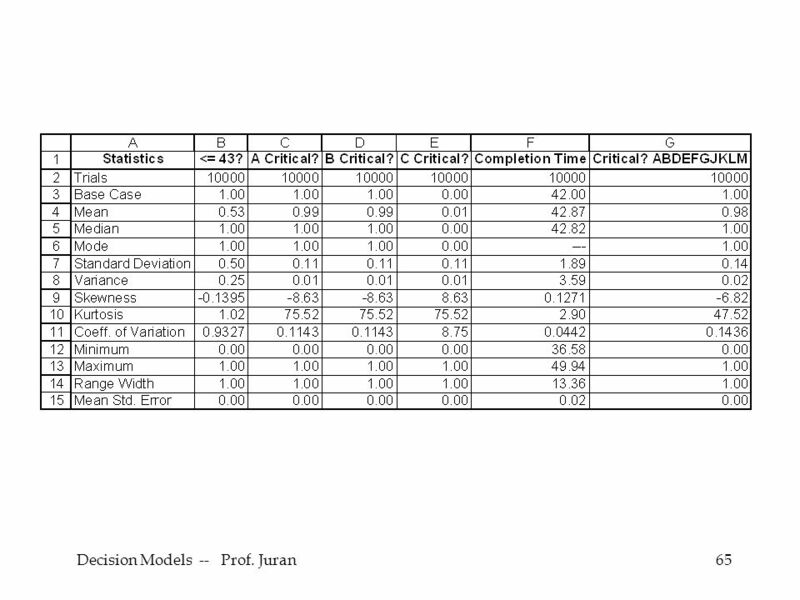 Five Categories of Spreadsheet Analysis Base-case analysis What-if analysis Breakeven analysis Optimization. 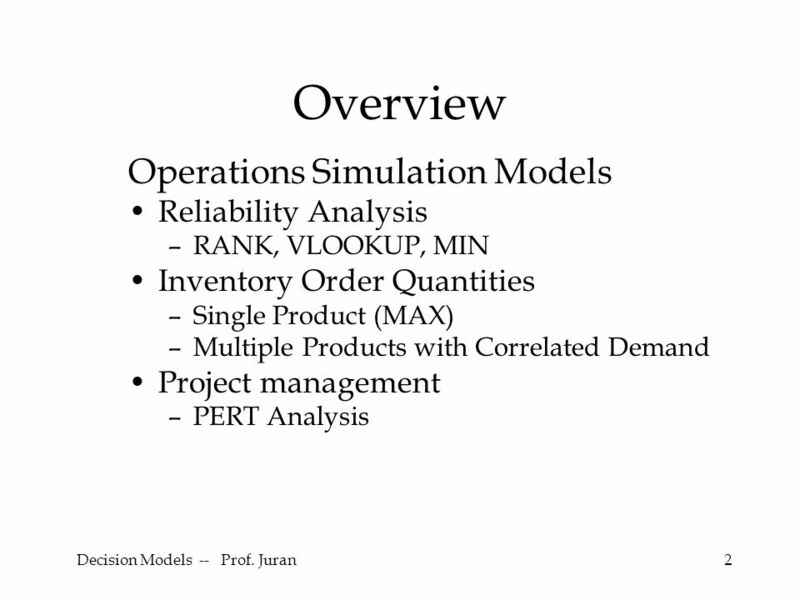 Simulation Operations -- Prof. Juran. Session 7a. 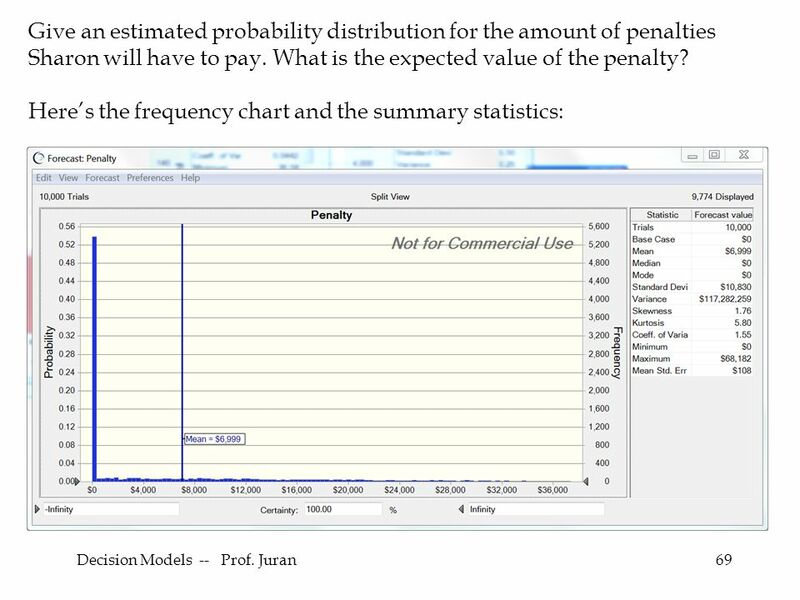 Decision Models -- Prof. Juran2 Overview Monte Carlo Simulation –Basic concepts and history Excel Tricks –RAND(), IF, Boolean Crystal Ball. 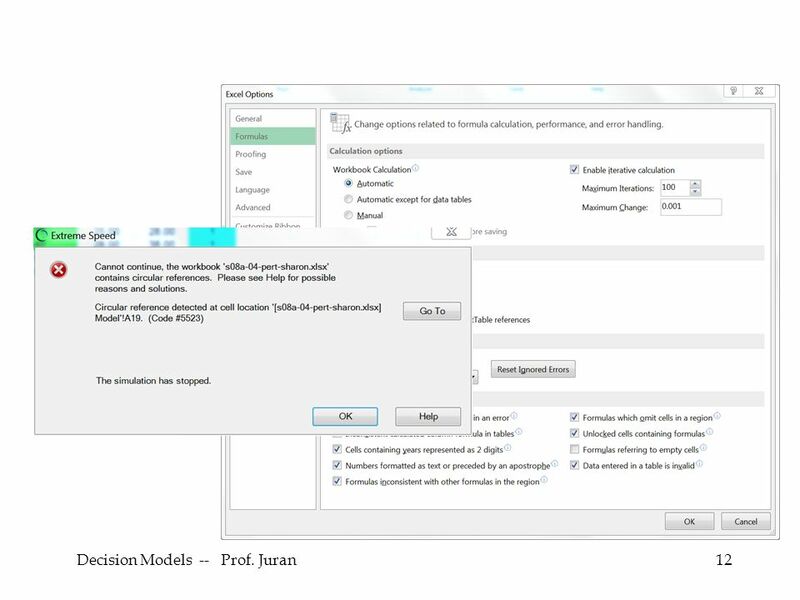 Spreadsheet Demonstration New Car Simulation. 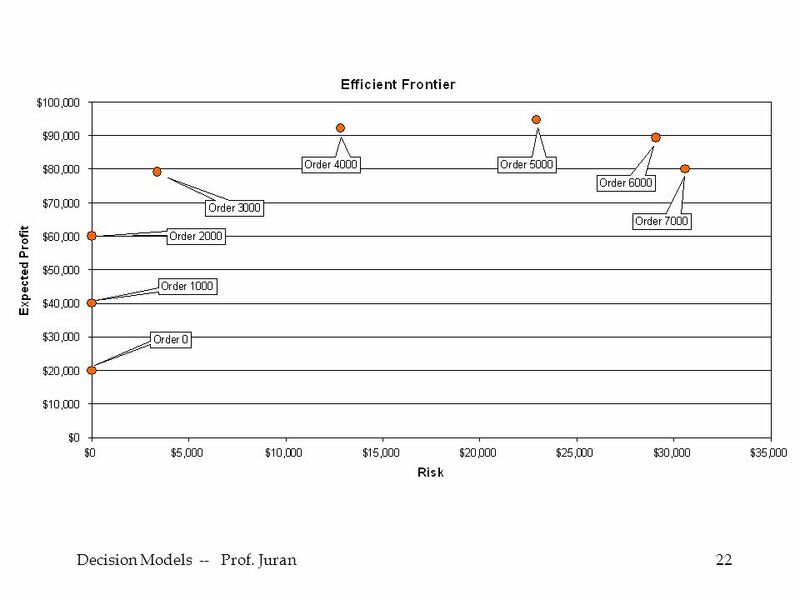 2 New car simulation Basic problem  To simulate the profitability of a new model car over a several-year. Building and Running a FTIM n 1. Define the system of interest. 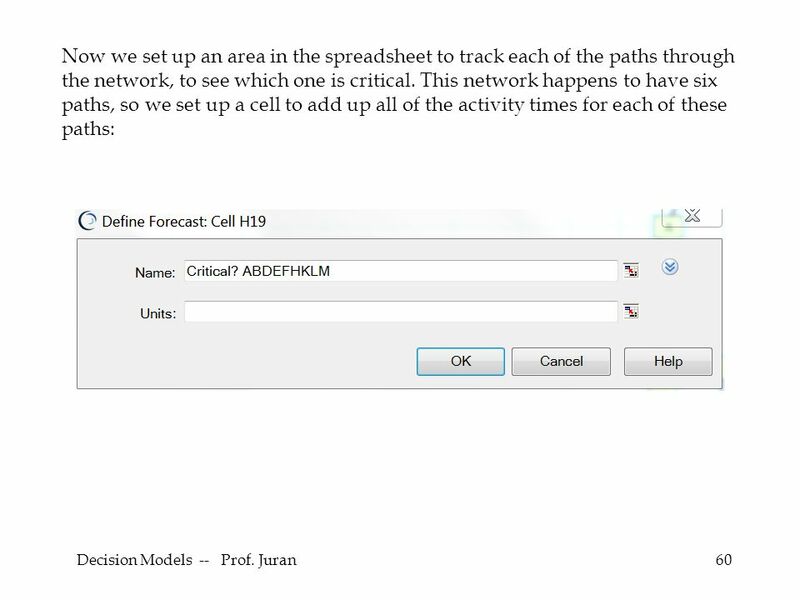 Identify the DVs, IRVs, DRVs, and Objective. n 2. 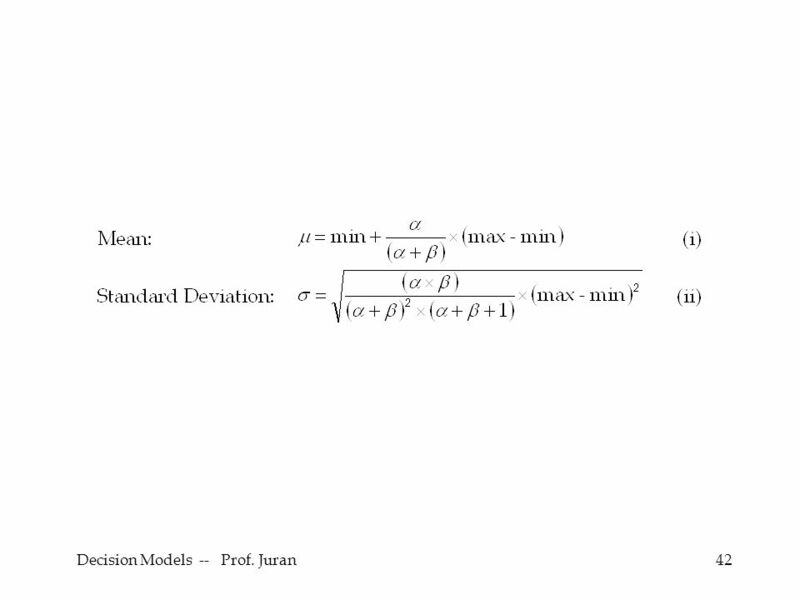 Develop an objective function of these.